Temperature is critical to the quality and safety of oysters in supply chains. Measuring temperature is especially important to demonstrate how the value of their oyster product is markedly affected during transport and storage, situations where vendors are normally in control. Accessing supply chain temperature profiles allows companies to visualise events that may affect product quality, which end-customers experience, provides information about the performance of shipping companies and other product handlers, and identifies points in the cold chain where performance could be improved. 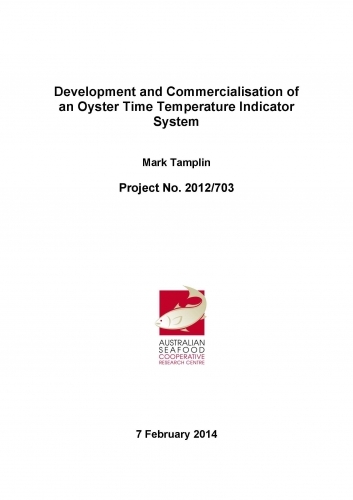 A ConTag time-temperature logger was produced and integrated with Oyster Refrigeration Index models produced from ASCRC projects 2007/719 (concluded March 2011) and 2008/700 (concluded August 2011). A small marketing trial was conducted with ten Tasmania oyster companies. Of the 40 total loggers sent to the companies, only nine were returned. The marketing trial, showed that some oyster companies accepted the time-temperature logger as a valuable part of their quality assurance systems, other companies intended to use it irregularly, or only for long shipments, and other companies had little or no interest.